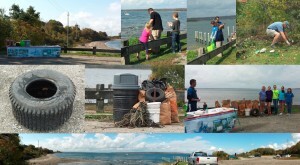 On a blustery Saturday afternoon a team of 17 people removed 201 pounds of marine debris from the shoreline of Weaver Cove in Portsmouth RI. Empire Tea & Coffee provided great beverages and it was the Ice Coffee that hit the spot this week! We had good talks with people walking, boating and fishing and everyone agreed that taking good care of our coastline and natural resources is a really important thing to do. Thanks also to the Seaweed Nutrient Analysis team collecting 6 water samples and 6 seaweed sample and also to 2 more people who signed up for a spot on Sachuest Point. A good Saturday for COA! Previous PostPrevious Enjoy the weekend!